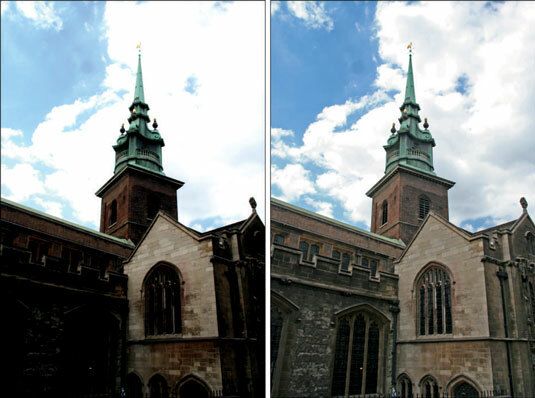 The Shadows/Highlights command in Photoshop Elements offers a quick and easy method of correcting over- and underexposed areas, as shown on the left. This feature works especially well with images shot in bright, overhead light or in light coming from the back (backlit). These images usually suffer from having the subject partially or completely covered in shadows. When the dialog box appears, the default correction is applied automatically in your preview. If the default adjustment doesn’t quite do the job, move the sliders (or enter a value) to adjust the amount of correction for your shadows (dark areas), highlights (light areas), and midtones (middle-toned areas). Your goal is to reveal more detail in the dark and light areas of your image. If, after you do so, your image still looks like it needs more correction, add or delete contrast in your midtone areas. If only part of your image needs correcting, you can select just that portion before applying the adjustment. If you want to start over, press the Alt (Option on the Mac) key, and the Cancel button becomes Reset. Click Reset to start again.